Fordham’s purchase of the College Board condominium on 45 Columbus Ave, which is set to replace a number of facilities and operations at Fordham College at Lincoln Center (FCLC), will close in June 2014. The Observer spoke to Bryan J. Byrne, vice president of FCLC, for an update on this new acquisition, as well as the new Law Building, current “140” Law Building and the Lowenstein building. Observer: Which buildings are Fordham currently using? Which facilities are going to be relocated? Bryan J. Byrne: So far, the University is currently leasing three buildings for different operations. These spaces occupy approximately 100,000 square feet. [The following buildings include:] 33 West 60th Street, which has five floors that also includes Fordham’s Career Planning and Placement; 888 Seventh Avenue, which holds the Development Office; and 1790 Broadway. Observer: What is the reason for relocating these facilities to the College Board condominium? BJB: There is a big financial advantage for the university by acquiring and moving into this building; the cost for each of these leases is at a high cost. By buying [the College Board condominium], we are able to get rid of all those expensive leases and save money. In addition, the condominium will be close; having these operations in one building will be easier to run for Fordham. 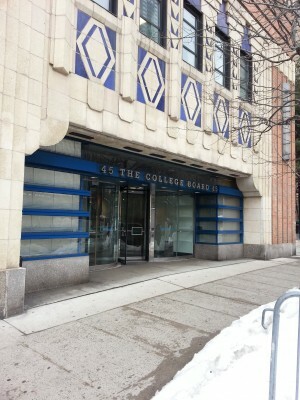 Observer: When will the relocation into the College Board condominium take place? BJB: The space will not be available until the first quarter of 2015; it also will take some time for the College Board to move into their new space. Given the time required for us to move, make improvements and renovations to the condo, it will take us until March 2015 to be completed. Observer: When will the new Law Building and Residence Hall, as well as the “Old” Law Building, be officially open? BJB: [The new Law Building and Residence Hall] will open mid-summer 2014. We are targeting for the “Old” Law Building to open summer 2016; the building was opened in 1961, so there are still many renovations and improvements set to take place. Observer: How is Fordham planning on utilizing the “Old” Law Building once the new law building opens? BJB: As decided by the Lincoln Center Space Planning Advisory Committee (LCSPAC), there are three elements that will be incorporated into the old building: the relocation of Quinn Library, a Student Affairs department and a complex for the Graduate School of Business. We have been continuously working with architects, engineers and contractors for planning the new building. Observer: How will the relocation of these facilities into the new Law Building and Old Law Building affect operation in Lowenstein? BJB: By moving these facilities into different buildings, there will be more space in the Lowenstein building. For instance, there will be more office space for faculty and staff.